McDavid vs. Matthews: Competition or No Contest? They played together on Team North America during the World Cup of Hockey. They bonded as teammates and friends. They are both two of the most anticipated young players in the NHL. Connor McDavid has been hailed as the next great one, despite only having played in 45 career games (prior to opening night). He is the newly appointed captain of the Edmonton Oilers. He figures to be the face of the league. He seemed to have separated himself a little (in terms of attention) from Jack Eichel, who was drafted right after him. But there’s a new kid on the block. And he might give McDavid a run for his money. No player in the modern era had ever scored four goals in their first NHL game. Auston Matthews was nearly unstoppable in his debut, accounting for all of the Maple Leafs goals (in a losing cause). 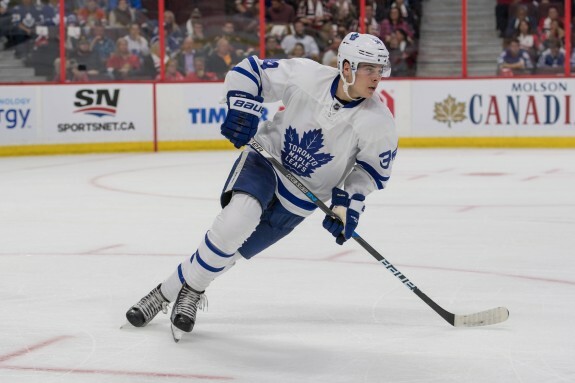 There was a lot of hype going into the season surrounding Matthews, because first of all, this is Toronto we’re talking about, and secondly, the kid is really talented. But no one, including excited fans, expected what happened in Matthews first official NHL appearance. This isn’t an attempt to rain on anyone’s parade because, the kid was amazing, there’s no disputing that. But Matthews set nearly an impossible standard to live up to. He’s not going to score like this every game. And the Ottawa Senators played horrifically defensively. Having said that, it’s still really exciting to see a player break out like this. That’s what the NHL should be all about. Young guys, full of skill and speed, scoring big goals and lifting the fans out of their seats. Despite as much fun as neutral zone traps and 1-0 games are, that is. Maple Leafs fans have been waiting a long time for a franchise player. They have one now. But it isn’t because of one great game. Matthews is big, he’s strong, he’s fast, he plays well at both ends of the ice and he’s going to be great for a long time. The worst thing to do is overreact at such a small sample size. But when dealing with hockey fans, that’s normally what happens. Another overreaction is to suddenly suggest that Matthews is better (or will end up better) than Connor McDavid. Breaking news: it’s okay for there to be more than one good player in the NHL. In fact, it’s a great thing. It’s okay to watch other players and enjoy their talent without immediately having to compare them to another player. But that’s human nature, isn’t it? Everything is a competition. Who is better, cast your vote! In all honesty, the comparison game robs you of appreciating each individual player for who they are. But the NHL wants things to be this way. They love to manufacture rivalries and push them on fans. Poll question “Who’s the next Great One…Connor McDavid or Auston Matthews?” The best part of this question is…we get to ask it! The most overblown player rivalry has to be between Sidney Crosby and Alex Ovechkin. They play different positions. They weren’t drafted in the same year. And let’s face it. In terms of team awards (which is what really matters in hockey), Crosby is far and away the winner. Ovechkin has never made the third round of the playoffs (despite playing on championship-calibre teams), while Crosby has two Stanley Cups and a Conn Smythe trophy under his belt. In a perfect world, we can celebrate Ovechkin being the best goal scorer of his generation while celebrating Crosby being the best all-around player. But this isn’t a perfect world. And since Eichel vs. McDavid isn’t as juicy as everyone wanted, why not try a different foe? Matthews already has four goals, and McDavid only had 14 in his rookie season (albeit one shortened by injury). So he must be better. Other than the fact it’s the smallest sample size possible, Matthews’ greatness doesn’t at all diminish that of McDavid. And you simply can’t compare one to the other this soon in their careers. 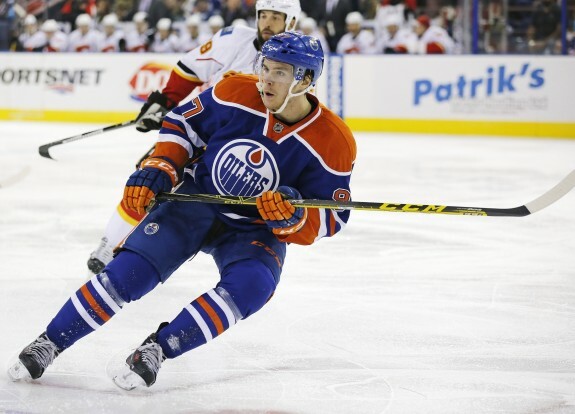 After Matthews became the talk of the hockey world, all eyes shifted to McDavid. How would he “respond?” Well, not only did he have a big game offensively (three points), but, and most importantly, he led his team to victory. That distinction can’t be said of Matthews, who actually took responsibility for the loss. McDavid’s two goals (one on a penalty shot) went a long way in securing the Oilers victory in what was a pretty crazy game. His second goal turned out to be the game winner. For one night at least, McDavid wins. Can Matthews challenge McDavid for the title of best player in the league? First of all, McDavid has to earn that title in order for it to be in question. And secondly, Matthews has to have more than just one great game. The best-case scenario for the NHL is that both of these guys tear up the league and lead their respective teams to victory. The best outcome is that they inspire young players in both the United States and Canada to want to play hockey. During the World Cup of Hockey, Matthews shared his thoughts on a budding rivalry with McDavid. Both players know their names will often be mentioned in the same breath. All of these guys are competitors and want to be the best. Certain players get more attention, that’s the nature of the game. But each player can only worry about himself. McDavid had some wise advice for Matthews as he prepares for life in the NHL: Work hard and earn the respect of your teammates. Advice for the fans? Don’t waste time trying to decide which player is better. Just sit back and enjoy the ride. It’s going to be a lot of fun.